Cox's Bazar - An estimated 2,000 Rohingya refugees a day are still arriving in Cox’s Bazar, Bangladesh, having fled violence in Myanmar’s North Rakhine State, according to IOM staff monitoring the Bangladesh-Myanmar border. The new arrivals bring the total number of refugees to cross into Bangladesh since 25 August to an estimated 515,000. Observers believe that as many as 100,000 more people may be waiting to cross into Cox’s Bazar from North Rakhine’s Buthidaung Township. Many of the refugees arrive in Teknaf – Cox’s Bazar’s southernmost upazila or sub-district – but then move north to Ukhiya sub-district and the vast, teeming makeshift settlements of Kutupalong, Balukhali and neighbouring satellite sites. They arrive exhausted, hungry and usually with nothing more than the clothes on their back, having walked for days and then braved a dangerous river or sea crossing. Many show signs of malnutrition. Yesterday, Nunavet, 70, walked aimlessly through Kutupalong, tired and in desperation. The frail, skeletal old lady was hungry. Her face, etched with deep wrinkles, spoke not just of fatigue, but of a life of hardship endured over the years. Overcoming the language barrier, she mumbled through her ailments, pointing to her empty stomach, aching back and sore feet. IOM, the UN Migration Agency, this week appealed to the international community for USD 120 million through March to provide desperately needed aid to Nunavet and other Rohingya refugees who have flooded into Cox’s Bazar over the past six weeks. It aims to target 450,000 individuals (90,000 households) over the next six months. 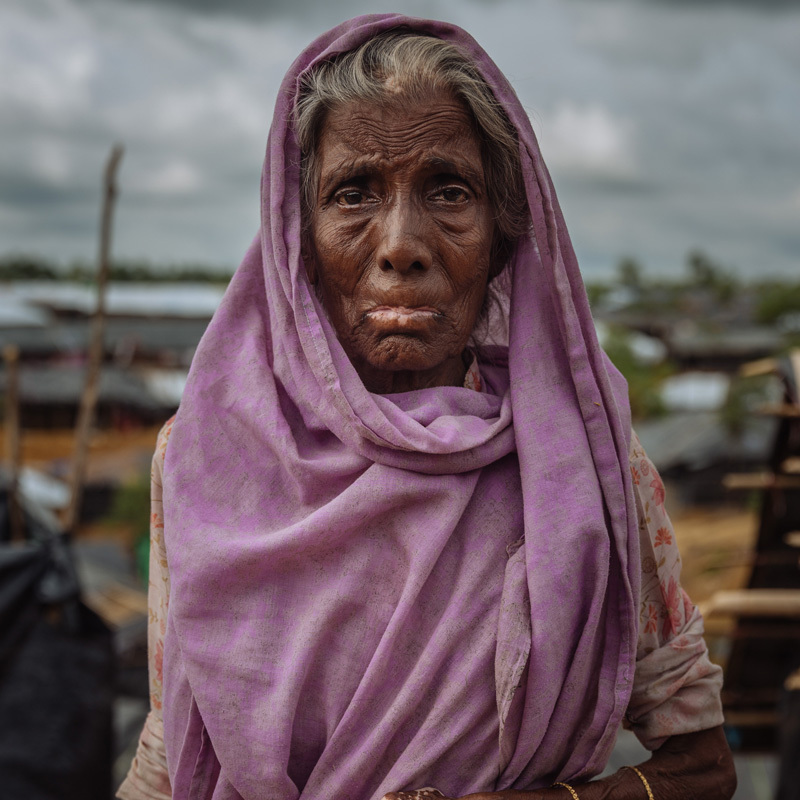 The IOM appeal is part of a broader humanitarian response plan seeking USD 434 million to help 1.2 million people, including the Bangladeshi host community. At the request of the Government of Bangladesh, IOM is hosting the Inter Sector Coordination Group, which is coordinating the work of aid agencies responding to the humanitarian crisis triggered by the influx. It is also leading the coordination of three sectors – shelter and core relief items, displacement site management and communication with displaced and host communities. IOM’s operations focus on six sectors: shelter and core relief items; site management; water, sanitation and hygiene (WASH); health; coordination; protection; and communication with communities. Life-saving services delivered IOM and its partners include clean water and sanitation, shelter, food, security, health care, education, and psychological support for the most vulnerable individuals, many whom are suffering from acute mental trauma or are survivors of sexual violence. In the settlements, people standing in line for aid snake around the various distribution points set up by aid organizations and local NGOs. As they wait for hours for rice, biscuits, plastic sheets, jerry cans and hygiene materials, the number of children stand out. An estimated 58 per cent of the refugees are under the age of 18. To date, IOM has distributed some 40,000 plastic tarpaulins to provide basic shelter for the refugees since 25 August. These include some 4,000 shelter kits comprising two plastic sheets, two ropes, two blankets, and one sleeping mat per family, donated by the United Kingdom’s Department for International Development (DFID). The sheer numbers of new arrivals have led to dangerous congestion in the existing settlements. On 14 September, the Bangladesh Government allocated 2,000 acres of forest land to set up a new camp adjacent to the existing Kutapalong makeshift settlement. Yesterday, it allocated another 1,000 acres of land to cope with the spiralling numbers. Officials plan to use the vast site to accommodate all the Rohingya refugees in Cox’s Bazar – both new and old arrivals – in one settlement. At close to 700,000 people, this will become the world’s largest refugee camp. The challenges of establishing the camp on inaccessible, hilly terrain, are vast. The site is entirely undeveloped and will require planning and infrastructure investment for roads and bridges, the installation of drainage systems and soil protection earthworks to reduce the risk of landslides. It is currently accessible by just one road – the Cox’s Bazar–Teknaf Highway – which is already permanently congested by aid trucks and local traffic. In the meantime, aid agencies are warning of acute shortages of food, which could soon lead to widespread malnutrition. An estimated 218,000 people are already in need of urgent nutrition support, including 145,000 children under the age of five and thousands of pregnant and lactating women. IOM medical staff, who have carried out over 33,000 consultations since 25 August, say that healthcare is also stretched to the limit, partly due to the lack of access to clean water and related growing numbers of diarrhoea cases. IOM has already delivered 310,000 litres of clean water to refugee sites, but this remains a drop in the ocean in the context of daily needs. Yesterday, IOM and the World Health Organization (WHO) led a health sector meeting with some 30 agencies to work on a preparedness plan for a diarrhoea outbreak. Health sector agencies will also launch a cholera vaccination campaign on 10 October. Over the next year, 650,000 people will be vaccinated in the settlements and adjacent host communities.